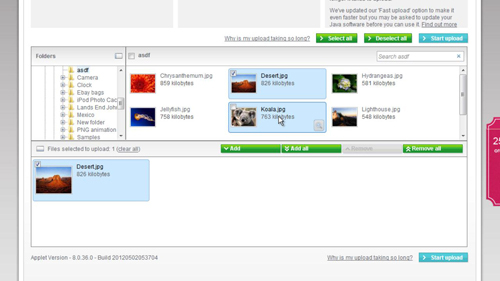 In this tutorial you are going to learn where to sell photos online. This tutorial is going to focus on one of the most popular sites: Photobox Gallery. First you are going to need to register an account with the site so visit, “www.photoboxgallery.com” and click the “Join-us” link at the top of the page. You will need to enter your information on this page as part of the registration process. Once you have filled out the data and accept the terms and conditions, click on the “Sign up now” button. You are now registered with the site and on the next page click the “Upload your photos” link. Click “Upload photos” on the next page. If Java asks to run at the top of the page click “Run this time”, in the dialog box that appears click “Run”. An explorer style window will appear further down the page and you need to select photos from your computer to upload, locate the photos you want to upload and check the box next to them. Here we are just checking the box on one as an example. Click “Add” and then “Start upload”. A window will appear informing you of the progress of your upload – you will need to wait for this to complete. Once it has been processed by the site you will be redirected to where the file is located on the site. 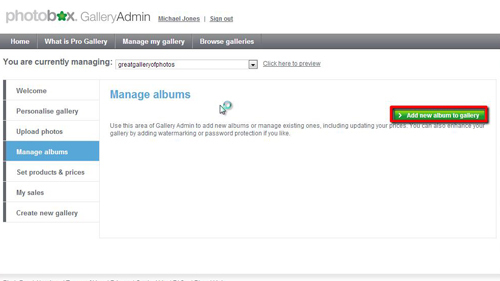 Go back to the previous tab and click the “GalleryAdmin” heading at the top of the page. On the left click the “Manage albums” option. On the right click “Add new album to gallery”. Select the album we just created and click “next”. On the next page choose the “Listed” option and choose three options that describe your album, click “Save”. Now our image is actually up for sale. To test this out we are going to open an incognito window so that we are not logged into our account. 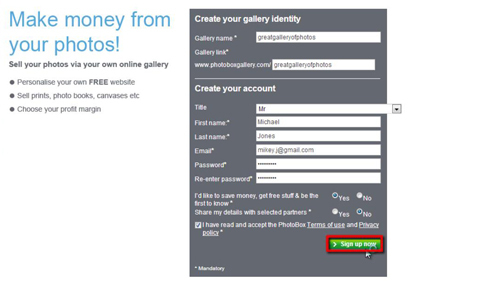 We will then visit our gallery page which is located at “www.photoboxgallery.com/[your chosen user name]”. Click on the album and then check the box next to the photo that you want to purchase and click the “Order selected images button”. 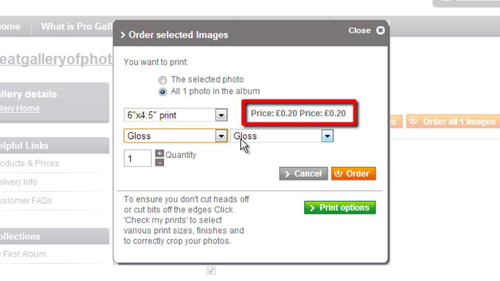 You will then see a dialog box that will allow the buyer to select what format they want to buy the photograph in and also list a price and that is where to sell photos online.